Own Care Bears & Cousins - Take Hearts DVD from Deff, DVD, Blu-Ray & 4K Video Specialists - Free UK Delivery..
Own Care Bears - A Little Help DVD from Deff, DVD, Blu-Ray & 4K Video Specialists - Free UK Delivery..
Own Care Bears - Cheer There And Everywhere DVD from Deff, DVD, Blu-Ray & 4K Video Specialists - Free UK Delivery.. When one of his jokes goes wrong, Funshine Bear leaves Care-a-lot to find a place where his sense of humour will be appreciated. His travel takes him to Joke-a-lot, a whimsical land where humour rules and Funshine is made King! He is even given the royal scepter guarding the magic jewels which hold the secret to Joke-a-lot's power to tickle the funny bone. Worried about their lost friend, Tenderheart, Cheer Bear and the other Care Bears..
Own Care Bears - Magic Mirror And Other Stories DVD from Deff, DVD, Blu-Ray & 4K Video Specialists - Free UK Delivery..
Own Care Bears - Oopsy Does It DVD from Deff, DVD, Blu-Ray & 4K Video Specialists - Free UK Delivery.. Welcome to Care-a-lot, the Care Bear's home in the clouds. Whether it's adopting a lost baby star, looking after Grumpy when he hurts his foot cleaning up Rainshine meadows, the Care Bears discover the true meaning of helping others. 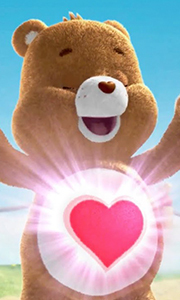 Get Ready to journey into Care-a-lot for more charming Care Bear adventures. This release features six new Care Bear episodes: Share and Share Alike All you need is Gobblebugs Grizzle-ized Flower Power Bat.. It's time for the Twinklets' migration over Care-a-lot, but the Care Bears wait all night without spotting any Twinklets. When a single Twinklet suddenly appears and falls to the ground, Share Bear decides to take matters into her own hands. The other bears are skeptical about the existence of the mythical Princess Starglo, but Share is convinced that the Princess can solve the mystery of the missing Twinklets. So, with the lone Twinkle..
Own Care Bears - The Giving Festival DVD from Deff, DVD, Blu-Ray & 4K Video Specialists - Free UK Delivery.. There's always one group of animated friends everyone can turn to for fun, adventure and joyful endings. Dedicated to celebrating each day to the fullest, the Care Bears - easily distinguished from one another by the caring designs on their tummies, are guaranteed to spread joy wherever they go! Episode Guide: The Lucky Charm - When 'Jinx Jacobs,' as Millie's friends call her, begins to believe that she is indeed bad luck to herself and.. Eight fun-filled episodes of the children's animated series, about the bears who live in the land of Care-a-Lot and who are always ready to put a smile on a child's face... Episode Guide: The Magic Shop / Concrete Rain, Birthday / Camp, The Last Laugh / The Show Must Go On, Dry Spell / Drab City..
Own Care Bears - To The Rescue / Share Bear Shines DVD from Deff, DVD, Blu-Ray & 4K Video Specialists - Free UK Delivery..
Own Care Bears - To The Rescue DVD from Deff, DVD, Blu-Ray & 4K Video Specialists - Free UK Delivery..
Own The Care Bears - Totally Sweet Adventure DVD from Deff, DVD, Blu-Ray & 4K Video Specialists - Free UK Delivery.. The World is in trouble...and it's up to the Care Bears to save it! Starring everyone's favourite animated characters and featuring the voices of Mickey Rooney (Babe: Pig in the City) and Georgia Engel (Dr Doolittle 2), as well as songs performed by Carole King. The Care Bears Movie will dazzle and delight viewers of all ages. Way up high where the clouds and rainbows live, the Care Bears watch over the Earth and make sure everyone is k..
Own Care Bears & Cousins - BFF’s DVD from Deff, DVD, Blu-Ray & 4K Video Specialists - Free UK Delivery..
Own Care Bears - The Birthday And Other Stories DVD from Deff, DVD, Blu-Ray & 4K Video Specialists - Free UK Delivery..
Own Care Bears - The Complete Collection DVD from Deff, DVD, Blu-Ray & 4K Video Specialists - Free UK Delivery..
Own Care Bears - The Great Giving Holiday DVD from Deff, DVD, Blu-Ray & 4K Video Specialists - Free UK Delivery..